Historic ‘Soil-Veg’ Maps Available for Northern Sonoma Cty. 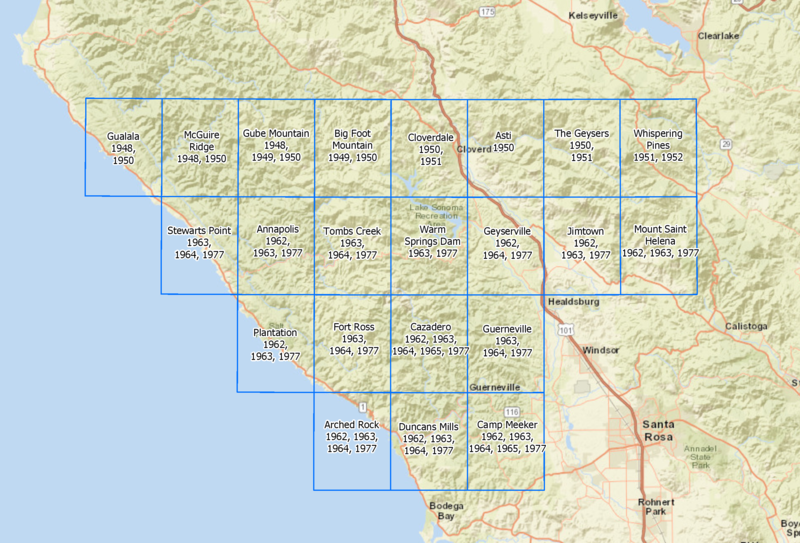 We are very excited to announce the availability of a set of historic vegetation maps for the northern portion of Sonoma County. The maps are the ‘Soil-Veg’ maps published in collaboration by California’s Department of Forestry (now CalFire), the University of California, and the U.S.D.A. Forest Service between 1947 and 1980. The maps contain detailed information about soils, dominant vegetation (listed by species in descending order of dominance), and timber site quality index. If you use these maps, please remember that they are very old and reflect the state of landscape between 40 and 70 years ago (date varies by 7.5 minute U.S.G.S. quad – see index map below). Also bear in mind that the maps were created at a small scale (1:31,680) and with far less advanced methods than those used in today’s digital age. Kass Green and Gene Forsburg (part of the Sonoma Veg Map team) were familiar with these maps and – when they realized the maps had probably never been scanned and georeferenced – asked Dr. Maggi Kelly (a Sonoma Veg Map advisor) at UC Berkeley’s Geospatial Innovation Facility (GIF) about them. Dr. Kelly tracked down the old maps, finding them at the Biosciences & Natural Resources Library and the Earth Sciences and Map Library. Through a generous gift from Kass and Gene to the GIF, UC Berkeley scanned and georeferenced the Soil-Veg map quads for Sonoma County. Thanks to these U.C. Berkeley Libraries for taking good care of the maps for all of these years so that we can share them with you today! Even though the ‘Soil-Veg’ maps are small-scale and old, they provide a key to species distribution for our team in areas where access is impossible. The 20th century veg. mappers were able to access broad areas of the county and used field visits in conjunction with photo interpretation of stereo pairs of aerial photography to make the maps. We are very excited because we know these maps have been helpful to us, and we think that they will be useful to others, especially those interested in the state of the landscape in the second half of the last century. The maps are packed with information. The graphic below shows part of a polygon and provides a rudimentary decoding of the information on the maps. Refer to the list of resources at the end of this post for more detailed information about the maps. The ‘Soil-Veg’ maps were created by 7.5 minute U.S.G.S. quad. The GIF scanned and georeferenced each of the individual quads (see map below) and then mosaiced them without their collars into a single TIF image. The TIF is available for download, and the mosaic has also been published as a tile service (see below for links). Check out this story map! This entry was posted in Mapping, Remote Sensing, Soils on October 10, 2016 by admin.